Do you know that food tastes better when prepared in a well-designed kitchen? A Kitchen is the heart of a home; the dining area can express the soul of a restaurant or a hotel. Kathy Bate, an award-winning interior designer for more than 35 years, focuses on designing kitchens and dining environments, for homes, restaurants, and commercial buildings. Kathy excels in creating the ambiance for celebrating togetherness over food, wine, and beverages. Green design is another important element in Kathy Bate’s designs, such as LED lighting, VOC-free paints, recycled glass countertops, and visually appealing sustainable materials such as these bamboo cabinets. 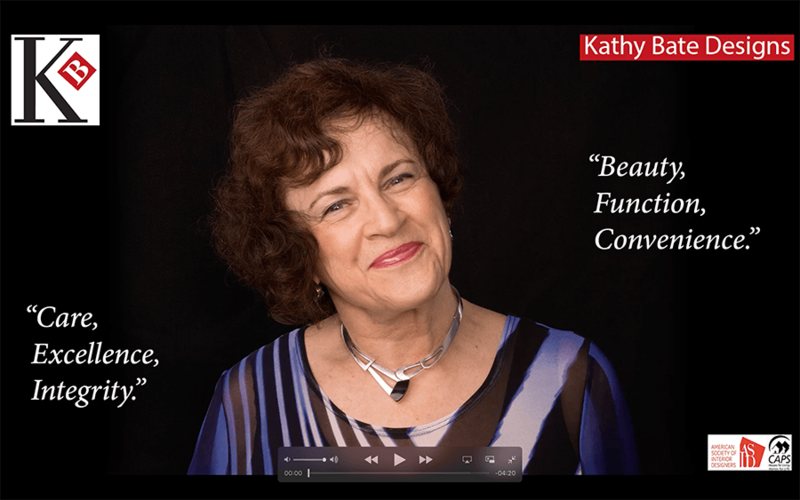 Kathy’s top priority is honoring each client’s vision and needs. By working together with craftsmen, muralists, glass and mosaic tile artists, she co-create artisanal, custom made elements to bring unique character to interiors with state of the art lighting, finishes and furnishings. In over 250 restaurant interiors, and many commercial, hospitality, and residential spaces, Kathy uses durable flooring and furnishings that are easy to maintain, like solid surface Quartz countertops. All spaces are easily accessible for people of all ages and abilities. In remodeling the Inn at Jack London Square’s reception area and guest rooms, to appeal to a higher level clientele, Kathy specified regional murals and art, to reflect the hotel’s geographic and historical location. By designing a unique, inviting, shared office space, Kathy Bate helped its owner combine his secretarial answering service with his vision for a co-working office. Kathy also draws interior architectural plans for building permits. In addition to homes and offices, Kathy has designed other commercial interiors including hotels, clubs, bars, banquet facilities, recreation and fitness areas, spas, corporate cafeteria, lobbies, offices, conference rooms, and senior housing. Kathy has made a difference in the quality of life for her clients, as evidenced by transforming a dated, cramped kitchen into a place where the joy of living is magnified in every detail. To open up another small galley kitchen and dining area, she guided her clients through the complicated and detailed design process including: planning, drawing, code compliance, and selections of materials, plumbing, appliances, lighting and more. Her clients appreciate her unique solutions to maximize storage, accommodate state-of-the-art appliances and to open up their kitchen to entertain guests. In this kitchen, where she used her clients’ preferred colors, Kathy and her clients were tickled to see its resemblance to the colors of their family cat, Romeo! It is not a coincidence that Kathy’s passions for designing and cooking enable her to see from both sides of the counter. “I serve my clients with the core values of care, excellence, and integrity. Together we will celebrate life by creating your own beautiful environment.